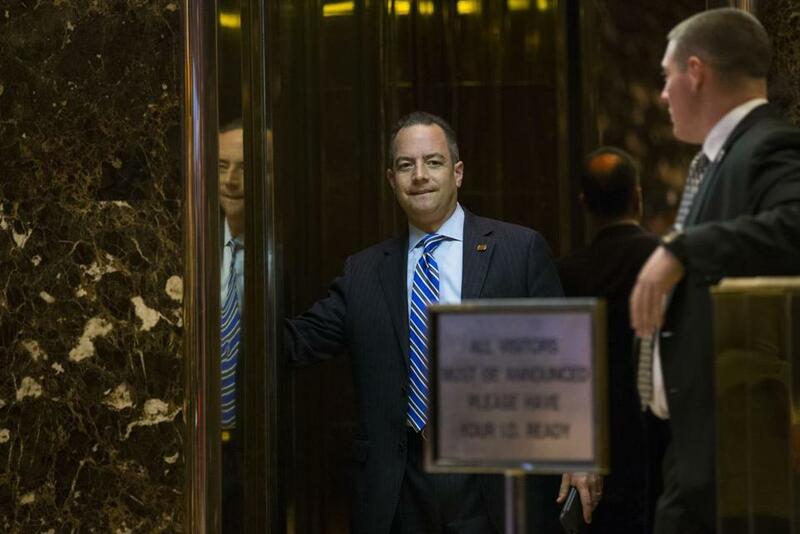 Reince Priebus, the Republican National Committee chairman, entered a lobby elevator at Trump Tower on Fifth Avenue in New York on Saturday. President-elect Donald Trump on Sunday said he would deport 2 million to 3 million undocumented immigrants when he takes office, but he also appeared to soften some of his campaign pledges and took a major step toward the GOP establishment by naming Republican National Committee chairman Reince Priebus as his future chief of staff. In Trump’s first television interview since Election Day, the billionaire businessman told “60 Minutes” that he will deport or incarcerate “the people that are criminal and have criminal records, gang members, drug dealers,’’ but at the same time he appeared to leave open the possibility that other undocumented immigrants would be allowed to stay in the United States. “After the border is secure and after everything gets normalized, we’re going to make a determination on the people that they’re talking about who are terrific people, they’re terrific people but we are going to make a determination at that,” Trump said in an interview that aired Sunday night. By choosing Priebus as his chief of staff, Trump went with a mainstream, traditional choice, preferred by Washington insiders. A Wisconsin native, Priebus, 44, is known to have close ties to House Speaker Paul Ryan, who would be a key ally in getting Trump’s agenda through Congress. Priebus remained largely loyal to Trump during his unorthodox campaign, although he sometimes struggled to defend the nominee’s many statements about treatment of women and minorities. 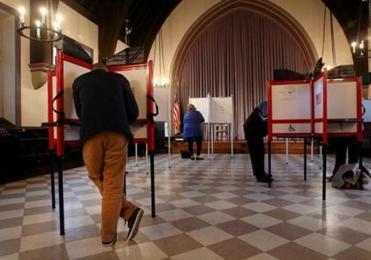 A Globe analysis of the state’s election results showed a reddening of the state’s western counties. Priebus, supporters suggest, is a Republican Party loyalist who will bring D.C. experience and political acumen to a White House lacking both. He was chosen over a much more controversial, and less-well known, candidate: Stephen Bannon, executive chairman of the conservative Breitbart News and the chief strategist of the Trump campaign. Bannon has a history of using his prominence to support anti-Semitic, xenophobic, and racist messages, according to the Southern Poverty Law Center, a watchdog group. In the Trump administration, Bannon will serve as a chief strategist and senior counselor to the president. “Steve and Reince are highly qualified leaders who worked well together on our campaign and led us to a historic victory,” Trump said in the announcement. The developments come at an extraordinarily divisive period in American politics. 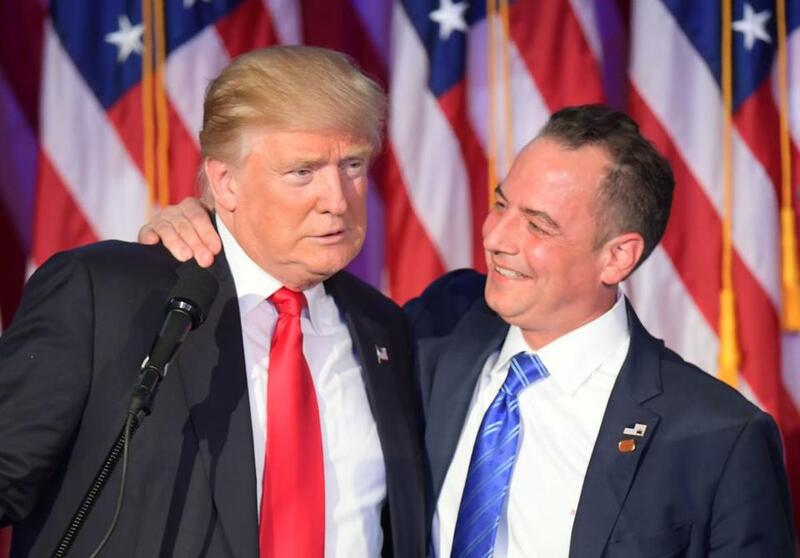 President-elect Trump with Reince Priebus on election night. Priebus will serve as chief of staff in Trump’s White House. In urban centers, protesters are speaking out against the presidential election, decrying the bombastic — and sometimes offensive — rhetoric that Trump used during the election season. Republicans, though giddy at the prospect of a conservative White House, Congress, and Supreme Court, are also unclear on just how much of Trump’s lofty campaign promises he will attempt to fulfill. Indeed, in the “60 Minutes” interview, Trump signaled that part of his promised wall at the Mexico border — a signature pledge during his campaign — might actually be a fence. Elsewhere on Sunday, Republican leaders also seemed to back away from some of Trump’s policy promises, including jailing Clinton, building the border wall, and implementing a deportation force. Speaking on Fox News, the House majority leader, Kevin McCarthy, said he does not expect Congress to push any further investigations of Clinton, despite the often-repeated rallying cry of “Lock her up!” at Trump’s rallies. McCarthy also expressed skepticism at the idea of mass deportations. ‘‘First thing you have to do is secure the border and then we’ll have discussions,” McCarthy said. Ryan, the House speaker who has rallied behind Trump after months of carefully putting distance between himself and the nominee, was more direct than McCarthy. “I think we should put people’s minds at ease. That is not what our focus is,” said Ryan, of Wisconsin. Ryan’s words and the seemingly moderated tone of the president-elect might not calm the fears of Democrats, protesters nationwide, and historically marginalized communities, many of which felt demonized throughout the Trump campaign. Some left-leaning activists have reacted to Trump’s election by rushing to social media to claim Trump is #NotMyPresident, despite the looming truth of Inauguration Day. Others, such as US Senator Cory Booker, a New Jersey Democrat, accepted the election results but pledged to hold Trump accountable for the divisive rhetoric he at times deployed. This sentiment, coupled with a recent flare of incidents in which self-described Trump voters were harassing people of different cultures, has received a mixed reaction from Trump’s closest advisers — and the president-elect himself. Trump has made clear that he intends to use Twitter to get his message out, and he continued to snipe at the media over the weekend. 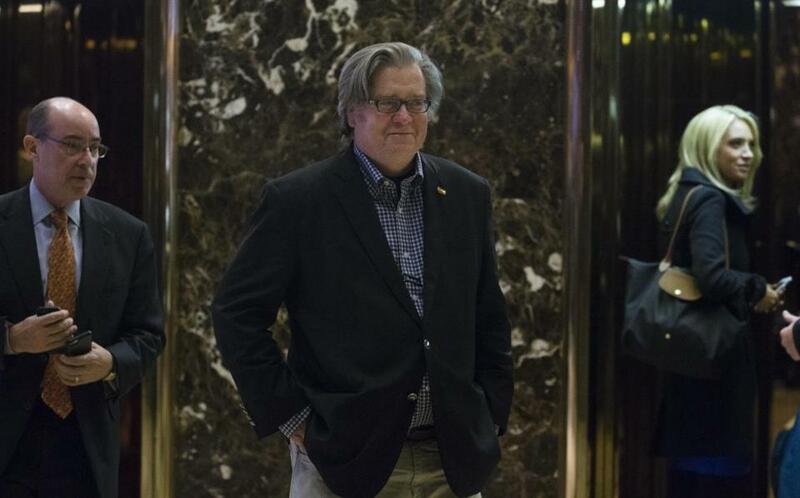 Stephen Bannon, whom Donald Trump named his senior counselor and chief West Wing strategist, at Trump Tower Saturday. “Wow, the @nytimes is losing thousands of subscribers because of their very poor and highly inaccurate coverage of the ‘Trump phenomena,’” Trump wrote in a tweet posted at 3 a.m. Sunday. In the “60 Minutes” interview, Trump explained that he uses Twitter to “get the word out’’ and go around traditional media outlets. “When you give me a bad story, or when you give me an inaccurate story,” Trump said, “I have a method of fighting back.” He vowed to be “very restrained” in his Twitter posts. On the Sunday morning political talk shows, Trump’s surrogates and advisers downplayed the nationwide anger that continued to surface since his surprising win. Instead, each attempted to recast Trump as a political unifier, a humbled leader capable of compromise and willing to govern for all Americans. There is one area in which Democrats and Republicans agree: the need for Trump to sign a robust law investing in the country’s infrastructure. Former House speaker Newt Gingrich, a Trump adviser, mentioned public works projects on CBS News’s “Face the Nation” Sunday, and on CBS News, Senator Bernie Sanders highlighted infrastructure as one area of possible common ground. “Let’s see the details. But, in general, rebuilding our infrastructure is absolutely imperative for this country,” said Sanders, an independent of Vermont. Sanders cautioned Trump against claiming any electoral mandate from Tuesday’s results, since Clinton received more votes nationally than Trump. “We are the majority,” Sanders said. Astead W. Herndon can be reached at astead.herndon@globe.com. Follow him on Twitter@AsteadWH.